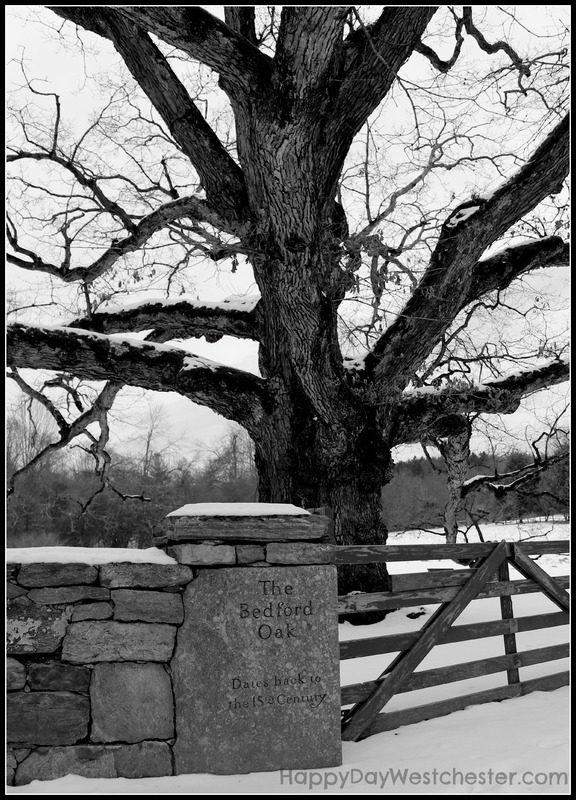 Not far from the center of town in the historic village of Bedford grows the mighty Bedford Oak. This wondrous tree first sprouted up out of the ground over 500 years ago. Before our lovely Westchester was a county – before New York was a state – before The United States was even a country – this tree started it’s journey. Recently, in the middle of an otherwise crazy day, we stopped by to see this ancient, mysterious tree for ourselves. The few minutes we spent under the canopy of this towering tree were the minutes my children were still talking about the next day. The Bedford Oak – does that sign say this tree dates back to the 15th Century? YES, it does! We’ll never know the details of all this tree has seen, and that’s part of its mystique. We all wondered: how many other children might have climbed these branches over the centuries? How many generations of people have sat in this shade, or collected fall leaves to press between the pages of books? How many windstorms, hurricanes, and droughts have been successfully endured? This tree has survived a war and watched a nation being born. We don’t have that many places or things in our everyday lives that have been direct witnesses to history; this beautiful, ancient tree is one of those witnesses. You can’t help but get a little quiet as you gaze at these huge, twisted branches, wondering at the possibilities. Thank you to all the people who have lobbied, fought and worked to keep this tree safe and alive. Particular thanks to the Bedford Historical Society, which currently owns and care for the tree. Follow this link to read more about the Bedford Historical Society and how it came to care for this tree. Maybe you need a few quiet, contemplative, peaceful moments in the middle of your hectic spring schedule. Would you like to check out the Mighty Bedford Oak yourself? It’s located at the corner of Hook and Cantitoe Streets in Bedford. Enjoy! Thanks you so much, Cheryl. The positive feedback truly means a lot to me! Have a very Happy Day!